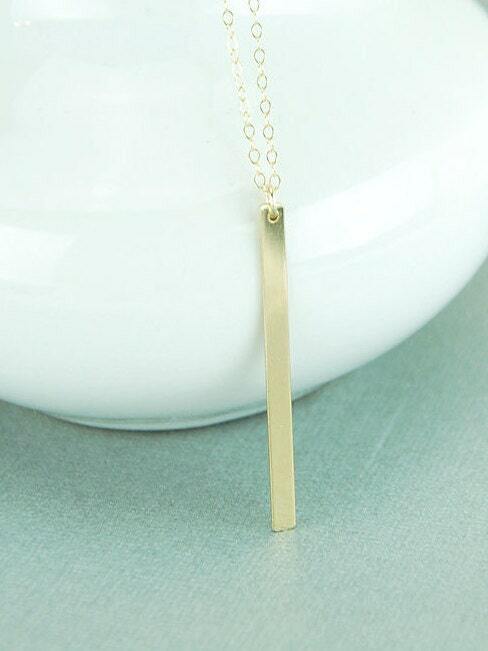 Delicate 14k gold filled bar necklace. Dainty gold jewelry that can be worn on its own or layered with other pieces. Classy and Chic! Also comes in Sterling Silver. ►All components are either 14K gold-filled or sterling silver. 2" x 1/8" (50 mm x 3 mm). Choose your preference from the drop down menu at checkout. MODEL LENGTH: 2-inch bar pendant on a 26 inch chain. (Note: The 1 1/2 inch bar pendant is also available. It is more petite in appearance). Length = open chain end-to-end. It does NOT include the drop length of the bar pendant. For necklace lengths 28 inches and over, no clasp will be attached. If you would like a clasp added, please specify this in the "note to seller" at checkout, otherwise the default will be no clasp. It was perfect! I just ordered this from my mom for Christmas and it came very fast! The packaging was adorable and you get a personalized little card from Karen. I would definitely recommend this to others!